As I may have mentioned, I have been recovering from the flu, and thus have been reading a way more than normal. 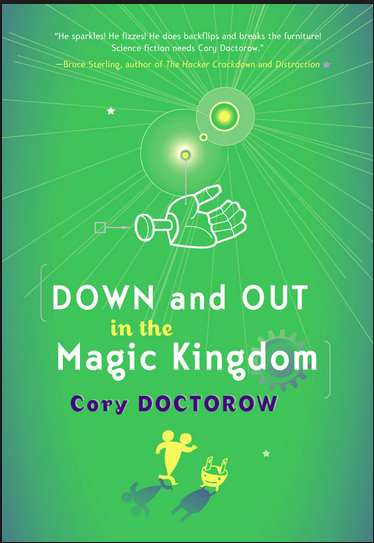 I hadn’t the focus for anything too drawn out or too serious, so I thought I would pick up an old Sword & Laser book pick – Down and Out in the Magic Kingdom by Cory Doctorow. Down and Out in the Magic Kingdom is the story of Julius who decides to pursue his childhood dream of living in Disney World’s The Magic Kingdom after finishing his fourth doctorate. Set in the future, the Earth’s new Bitchun Society is a place where technology has made material goods overly abundant and death a minor annoyance. Julius finds a girlfriend and a new life in Walt Disney World, working to maintain some of the Parks iconic attractions like the Presidents Hall and The Huanted Mansion. Things start to get a bit strange when it seems like a group of Imagineers want to take over and change some of the most historic aspects of the Magic Kingdom. Julius, his girlfriend Lil, and his college buddy Dan must go to extremes to try and preserve the soul of the park. Despite having a somewhat light premise (living inside Disney World), Down and Out in the Magic Kingdom actually explores some rather dark and serious themes. In a world where you can live forever, would you want to? And, if you didn’t, how would you know when it would be time to go? Would living forever be worth losing your memories? Or would it be better to restore yourself from backup before a point of major emotional damage? It’s the sort of book that probably would make you feel better if you couldn’t totally identify with the main character. I mean, sure, he does some things that I wouldn’t necessarily condone, but all of the big question life stuff he ponders… Yup. Been down those roads before. Overall I would have to say this was a surprisingly deep book for such a quick and easy read. I don’t know – maybe the idea of running away to Disney World after finishing up a chemistry degree holds a special appeal to me – but I found myself to be very empathetic with the main character. I mean, sure, I don’t have to deal with the possibility of an infinite future, but otherwise I can very much understand why he is so distraught over the choices he has to make, and why he so desperately wants to preserve relics from a time before this overly technological society took over. Some of the science fiction elements seem sort of ridiculous yet surprisingly prophetic – especially the concept of “Whuffie” – where the amount of respect you garner is the most important aspect of your social standing. In an age where everyone reminds you to “Hit the Like button,” I can totally see how this could relate to people gaining overwhelming influence in society. Despite the outward levity (I mean, Disney World, “Bitchun” Society, and Whuffie?) this book packed a surprising punch of reality and honesty about things that we have to think about in today’s world, and makes us ponder what it would be like if we had the option to erase them from our minds or deal with them for an eternity. I can see how the crazy science fiction terms could put people off, but I think this book is definitely worth a read, especially for anyone who “grew up Disney” and has a soft spot for The Haunted Mansion. On a side note – as it is wont to do when I am dealing with being sick, the sewing mojo has been very very absent during the month of February. But I have felt it starting to come back… slowly… as I have been feeling better. I totally missed out on the February Pattern Review Contest (which I totally wanted to enter!) but now that it is March (*gasp* how did that happen?) I really need to focus on skating costume orders anyway. As always, so many projects, so little time, but with any luck I might actually be bringing the sewing back to the sewing blog sometime soon. Maybe. Wish me luck.